In Kentucky, ten counties participate in the Chemical Stockpile Emergency Preparedness Program (CSEPP): Clark, Estill, Fayette, Garrard, Jackson, Jessamine, Laurel, Madison, Powell, and Rockcastle. In the map to the right, the green area is Blue Grass Army Depot (BGAD) itself. The pink area surrounding it is the Immediate Response Zone (IRZ), the parts of Madison and Estill County that are immediately adjacent to the depot – and therefore at the greatest risk from an incident involving the chemical weapons stockpile. The larger yellow area is the Protective Action Zone (PAZ), representing areas that are at less risk but could still be affected by a worst-case event. 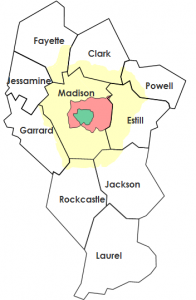 In a chemical incident, citizens in affected areas – primarily in Madison and Estill Counties – might need to evacuate. To support this protective action, Clark, Fayette, Garrard, Jackson, Laurel, and Powell Counties have host county CSEPP missions. A host county establishes screening and decontamination points to aid any evacuees who may be contaminated, provides medical services for exposure cases, and establishes shelters to temporarily house evacuees and their companion animals. Additionally, each county in the PAZ has plans for alerting and protecting its own citizens. These preparations are similar to those made for hosting evacuees from other counties. To learn more about Fayette County’s preparations, click here. Each county maintains ongoing training and planning activities. In addition, every fall, the entire Kentucky CSEPP program holds a full-scale exercise to test its capabilities. You can see photos of past full-scale exercises at our Flickr page.